It was a perfect country wedding. The sailcloth tent at sunset was magnificent! We could not recommend you more highly! The warehouse tent is super stable for helping our company to avoid loss from the hurricane thanks to Event Tent. A great job by Event Tent! Before the week moves too far, I wanted to be sure to let you know how beautiful and stable the tent was for last weekend’s gala. Thank you very much! The dome tent is gorgeous! We are pleased with the experience from start to finish. The attention and professionalism of your staff is impressive. TUV, ISO, SGS, BV, CE, etc. Ground Anchor/Weight Plate/Expandable Bolt, Etc. 1. Fabric Cover: 850g / sqm double PVC coated polyster fabric, white, yellow, red, blue 4 colors mixed together. 100 % waterproof, fire retardant ( DIN4102 B1 ), M2, CFM, UV resistant, tear resistant, self - cleaning ability. Besides PVC coated polyster fabric, the fabric cover can be transparent PVC, TPU or mixed together to make the dome tent in different design and style. 2. Base (or Footing): Hot dip galvanized steel parts, and used to connect the steel pipes and ground. On concrete floor, we use expansion screws to fix the bases with floor.On soft ground (grass ground mud ground ), we use big steel nails (anchor) to fix the bases with ground.On undistructible ground (marble, asphalt ground etc), we use weight plate system to fix the bases with ground. 3. Structure: Diameter 42mm, 2mm thick, hot dip galvanized steel pipes. Zink coated thickness is at least 60μm. Hot dip galvanized is the best anti rust treatment way for steel, better than electric galvanized. Hot dip galvanized steel can withstand the severe environment, such as salty air near the sea, moist air in the forest etc. 4. Steel Pipes Color: Powder coated, bake finished, thickness is at least 60μm. Bake finished is better than spray painting. The color will adhere strongly with the steel pipes, hard, and not easy to fall off from the steel. 5. Lighting Window: Made of transparent PVC, can be round or square shape, can't be opened. It use for lighting only. 6. Ventilation Window: Square roll up window, with mosquito net, waterproof. When raining or in winter, You can close the windows to stop rain and wind go inside. When in summer. You can open the windows for air circulation.There is mosquito net inside, no insect can go into the dome tent. 7. Door: Double swing aluminum frame tempered glass door. Durable, strong, luxury. There are other doors for optional, single swing aluminum frame tempered glass door, metal door, PVC zip door etc. Price is different. 8. Accessory: There are many accessories for optional, such as insulation lining, decoration lining, ventilation, solar power, floor system, fireplace, furniture etc. Price is competitive. 9. Packing: The steel structure & fabric cover are packed separately.The steel structure is packed in steel frames.The fabric cover is packed in pallet. 10. Installation: The steel pipes are fixed by screws and nuts.The tent can be fixed with ground through bases by different ways. If concrete floor, the tent can be fixed by expension screws. If soft ground (grass ground, mud ground etc), the tent can be fixed by big steel nails (anchor). If undestructible ground (marble, asphalt etc), the tent can be fixed by weight plate system. We can send one technician to guide the installation FOR FREE, but the buyer needs to cover the cost of visa, round trip air tickets , accommodation, food and other cost that happen in your country. Gymnasium (Sports): After make enough ventilation holes and windows on the tent, the large dome tent can be used as gymnasium. the space is big and no posts inside, can make use of 100 % space. Many persons do sports inside the tent, must make sure the air circulation, make sure enough fresh air inside. Wedding Party: We can design the large dome tent into many style according to the wedding party theme.To make the large dome tent suite the different style wedding, different types of party and make the party full of happy atmosphere. Hotel: After equiped with insulation lining, decoration lining, floor system, furniture etc, the large dome tent can be used as a comfortable outdoor hotel. Large dome tent is special with its shape and style, it can attract the eyes of everyone who see it. Trade Show: As the large dome tent has no posts inside, can make use of 100 % space, can set many trade booths inside the tent. Restaurant: The large dome tent can be used as any style restaurants. With special style and design, with luxury decoration, the large dome tent restaurant will have many visitors every day. 1. 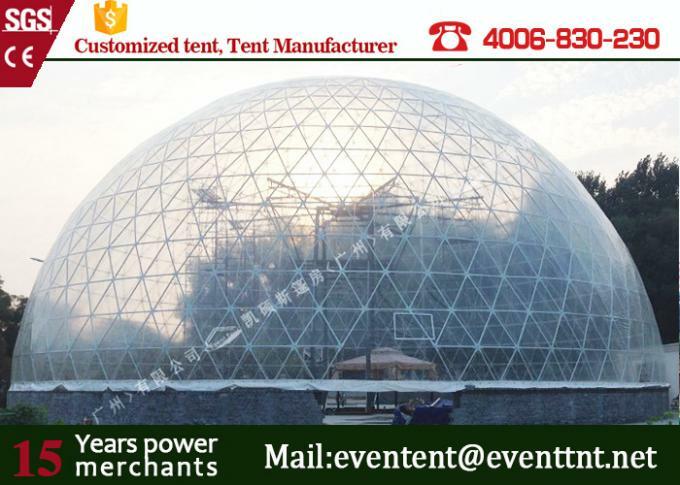 Specialized in producing dome tent: Dome tent is our main product. 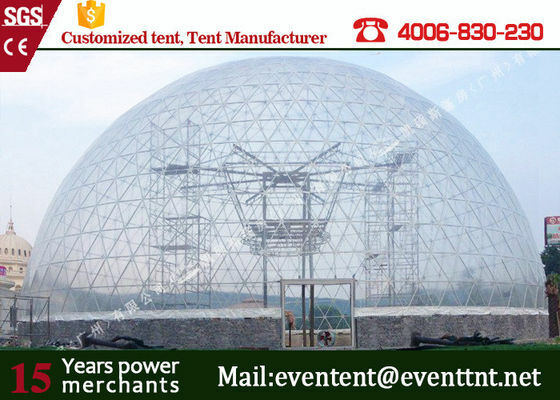 We specialized in producing any style dome tent, especially big size dome tent. 2. Leading advanced technology: In China, we have the leading advanced dome tent technology, still to produce high quality low price dome tent. the dome the size we can produce is from diameter 4m to diameter 80m. 3. Short delivery time: We can finish the production within 20 to 30 days, even if it is a large dome tent. 4. Good quality after sales service: We can supply easy understanding assemble instruction and drawing for you to instal the tent. if needed, we also can send one technician to guide the installation FOR FREE. But you need to cover the cost of visa, round trip air tickets, accommodation, food and other expense that happen during the installation. China Good Quality Large Dome Tent Supplier. Copyright © 2016 - 2019 largedometent.com. All Rights Reserved.